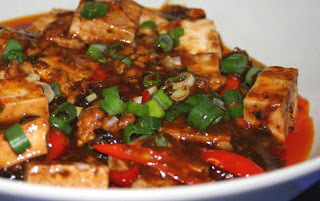 Cut tofu into small cube; set aside. Combine lemon juice, tamari, water, tomato paste, honey, ginger, and garlic; mix until well blended. Add tofu to this marinade, stir gently, and let marinate for several hours (or overnight). Stir-fry scallions, bell peppers, and mushrooms in 2 tsp. of oil. After several minutes, add tofu with all the marinade. Lower heat, continue to stir-fry until everything is hot and bubbly. Remove from heat and stir in cashews. Serve over rice.